1.2 Can Dogs Eat Candy? 1.3 Can Dogs Eat Chocolate? 1.4 Can Dogs Have Caffeine? 1.6.1 Is It OK for Puppies to Drink Milk ? 1.7 Can Dogs Eat Macadamia Nuts? 1.8 Can Dogs Eat Onions? 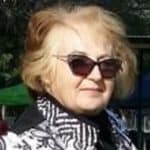 2 What happens if your Pomeranian eats these foods? 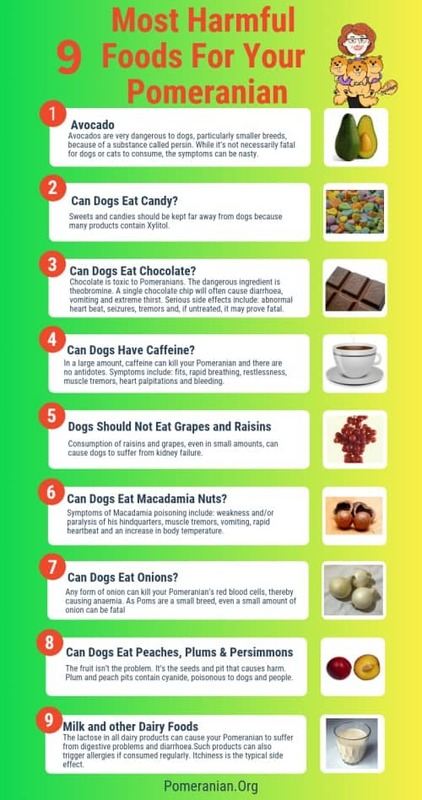 Listed are the 9 things not to feed your dog. While these foods may be safely consumed by people, they should NEVER be fed to Pomeranians because of the serious health problems they can cause. Are dogs allergic to avocado? Are dogs allergic to avocado? A delicious food to eat alone or with family and friends. However, when there’s food around, your Pomeranian is sure to be nearby. Avocados are very dangerous to dogs, particularly smaller breeds, because of a substance called persin. While it’s not necessarily fatal for dogs or cats to consume, the symptoms can be nasty. These include: diarrhoea, vomiting and/or constipation. If you know your dog has ingested avocado, watch for these signs and, if they occur, get him to the vet asap. 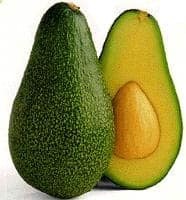 The more serious risk is that the big round seed in the avocado can be swallowed and get stuck in your Pom’s oesophagus, intestinal tract or stomach. The green avocado peel may cause internal damage because of its sharp edges as it’s consumed. What person doesn’t love candy? However, all sweets and candies should be kept far away from dogs because many products (such as baked goods, toothpaste, gum, candy and certain diet foods) gain their sweet taste from a product called Xylitol. This ingredient can increase the amount of insulin in your pet’s body. That can make his blood sugar levels drop and cause liver failure in extreme cases. Early symptoms to watch for include: lethargy, vomiting and poor coordination. Seizures may then ensue and liver failure may occur with a few days so act fast if you notice symptoms, before it’s too late. Pretty much everybody knows that chocolate is toxic to Pomeranians. The dangerous ingredient is called theobromine. This is found in most types of chocolate including white, dark and milk varieties. A single chocolate chip will often cause diarrhoea, vomiting and extreme thirst. More serious side effects include: abnormal heart beat, seizures, tremors and, if untreated, it may prove fatal. 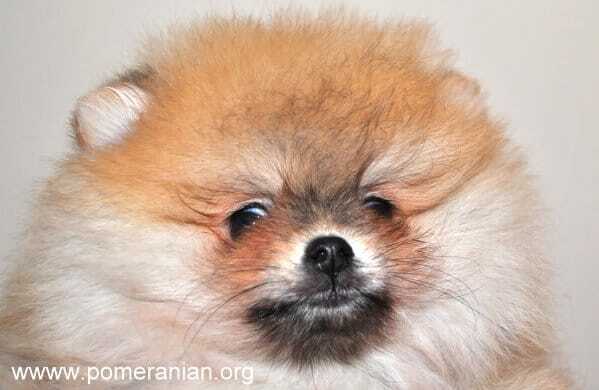 In a large amount, caffeine can kill your Pomeranian and there are no antidotes. Symptoms include: fits, rapid breathing, restlessness, muscle tremors, heart palpitations and bleeding. Ensure you keep all products with caffeine in them well away from your dog. This includes tea, coffee, cocoa, chocolate, sodas, energy drinks and so on. This also means the grounds and beans of coffee. If you throw things in the bin, ensure your dog can’t get at them. Caffeine is often found in certain medications so be careful when handling painkillers, cough medicines and other drugs. If you drop a tablet, grab it before your Pomeranian can get to it. 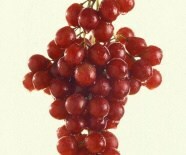 You may think that raisins and grapes are a delicious treat for your dog but FORGET IT! While scientists haven’t identified the reason, they have stated that consumption of these foods, even in small amounts, can cause dogs to suffer from kidney failure. Symptoms may include: continual vomiting, depression and lethargy. Enjoy these foods yourself but don’t give any to your beloved pet. Is it ok for my dog to drink milk? 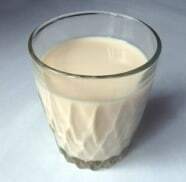 Is it ok for my dog to drink milk? The lactose in all dairy products can cause your Pomeranian to suffer from digestive problems and diarrhoea. I’m sure you don’t want to intentionally make your pet sick (Not to mention the need to clean up the unpleasant messes afterwards). Such products can also trigger allergies if consumed regularly. Itchiness is the typical side effect. Is It OK for Puppies to Drink Milk ? Don’t avoid giving your Pom dairy products completely. Dogs, especially pups, nursing and pregnant mothers, require milk and other dairy products as part of their diet for calcium. Low fat cheese, yoghurt and milk specially formulated for dogs and pups are the best choices to feed your Pomeranian. I don’t like Macadamia nuts so there aren’t ever any in my pantry. However, if you love these nuts, keep them away from your Pomeranian. This applies equally to other products containing these nuts. If your dog does consume even a few, it may prove fatal. Six nuts are enough to make a dog sick but because your Pom is a small breed, it can take just two or three nuts to make him ill. Symptoms of Macadamia poisoning include: weakness and/or paralysis of his hindquarters, muscle tremors, vomiting, rapid heartbeat and an increase in body temperature. 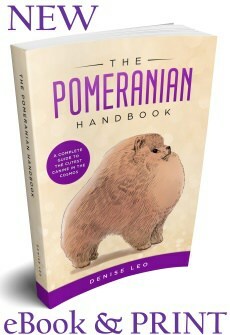 No Pomeranian should have to suffer these symptoms. 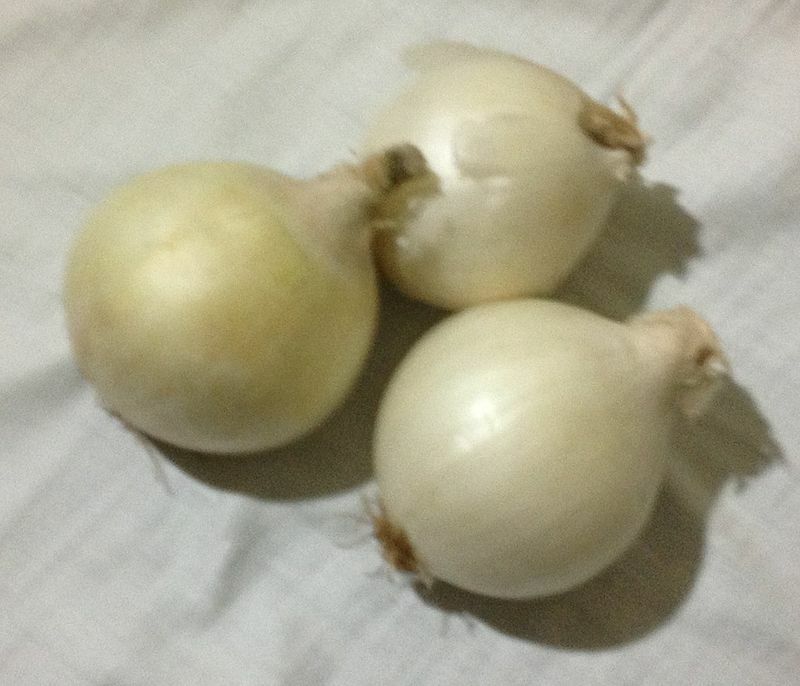 Any form of onion can kill your Pomeranian’s red blood cells, thereby causing anaemia. As Poms are a small breed, even a small amount of onion can be fatal if not treated fast enough. Anaemia symptoms. include: loss of appetite, vomiting, breathlessness, dullness and weakness. The fruit isn’t the problem. It’s the seeds and pit that causes harm. Persimmon seeds can inflame your Pomeranian’s intestines, causing an obstruction. Consider how horrible it would feel trying to swallow a whole watermelon. 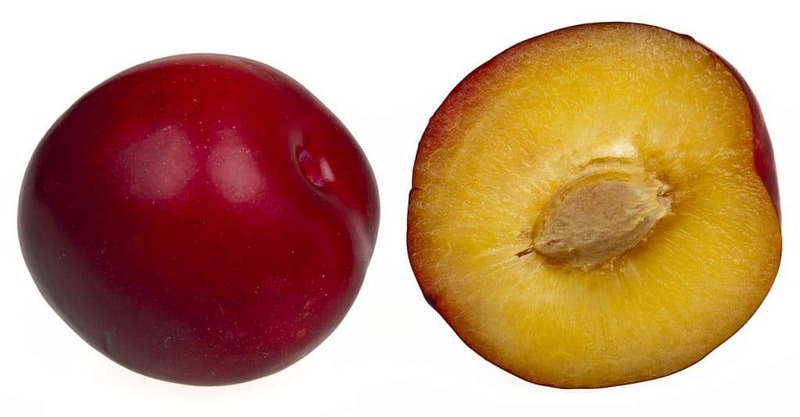 Plum and peach pits contain cyanide, poisonous to dogs and people. Pomeranians are generally clever, but some still don’t realise that fruit pits can’t be eaten. What happens if your Pomeranian eats these foods? Pomeranians are naturally inquisitive and love tasting and sniffing things. While owners do everything they can to protect their beloved pets, it’s also wise to have a plan of attack if your Pom does eat something dangerous. Keep phone numbers of your vet, the animal hospital and the Poison Control Centre on your fridge where you can easily see them in an emergency. How Old Is Your Pomeranian? Can Pomeranian Dogs Eat Fruit? Does Your Pomeranian Have Bad Breath?